Today the A6 crosses the Nene, its meadows and backwaters, on a concrete viaduct. It must have been quite something when it opened in 1936. A 1920s attempt to widen the bridge and its approaches was abandoned half-way through when it was found that the entire bridge was on the move seawards! It looks as though a recent strike by a vehicle has sent some of the stonework in that direction. That's the headline on an article by Matthew Norman on the Independent website today. Although Labour has done brilliantly so far at disguising this, it is barely less split than the Tories. Jeremy Corbyn, as Cable pointed out in a recent article, is far keener on Hard Brexit than May. Contempt for the EU has always been one of those points at which the far-left and far-right meet round the back. Whether Corbyn actually voted Out is between him and his ballot paper. But no one doubts he would have wished to, or that the truancy from the referendum campaign of someone whose great joy is campaigning was a device to avoid perjuring himself in public. So what happens when all those young Remain voters who turned to Labour at the general election realise that Corbyn is not some cuddly, pro-EU Gandalf? will find Vince’s Lib Dems waiting with open arms. Already, he has nimbly reversed his step over a second referendum. Betting the house that support will drain away from Leave as the general horror of Brexit and its specific impact on consumer prices hits home, he is now in favour. All in all, then, it’s nice to see Vince back, to see Vince back, as his Strictly warm-up man would want to add for clarity. Nice. England Lost uses a disenchanted, plain-speaking football fan as the narrator for what he said was the “feeling that we are in a difficult moment in our history”. If the England Lost music video is anything to go by, it’s clear enough that Jagger – one of the great re-exporters of US folk music to American audiences, whose band made arguably its best album while holed up in France as tax exiles – has misgivings about a Britain turning inward. It features Welsh actor Luke Evans as a polite, well dressed gentleman in a cryptic scenario where he is fleeing a menacing array of compatriots who end up dragging him back from the surf as he apparently tries to swim beyond British shores. Redcap was a television series about Sergeant John Mann, a member of the Special Investigation Branch of the Royal Military Police. 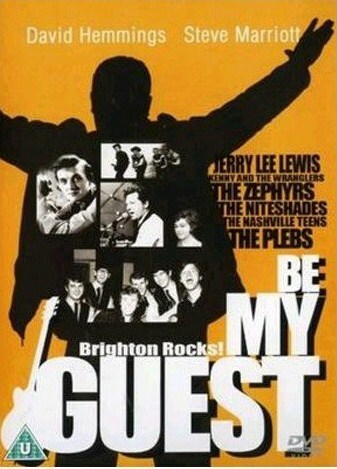 It was broadcast on ITV between 1964 and 1966. It is significant because the lead role was played by a young John Thaw. It is interesting to compare him here with Shaun Evans' rendering of the youthful Morse in Endeavour. But Redcap is interesting beyong the presence of Thaw, because so many good actors of the period appeared in it. This clip features the great Leonard Rossiter and Mike Pratt, but in just this episode you could also have seen Ian McShane, Bill Treacher (you know, Arthur Fowler off of EastEnders) and John Noakes. According to Wikipedia, 23 of the 26 Redcap episodes made still exist, and they are available on DVD. I went to Loughborough today to have a look at the preserved Great Central line. Work on reconstructing the bridge over the Midland main line is underway. This will eventually connect two preserved sections of the Great Central, creating an 18-mile length of preserved rail. The shortest route from Loughborough station to the the Great Central's preserved Loughborough Central lies along the canal towpath. Walking that way today I met this heron. Always solitary and a little disreputable, I feel sorry for these birds. A quite remarkable sight, lying as it does between the village and the river. The church is large and at first seems quite incongruous. What appears to be incongruous is however the survival of not only the church, but also the very tall and dominant tower to the W of the church which belonged to the college founded by the widow of John Pyel, a mercer of London, in 1388. This tower (which had to be reconstructed at the end of the 19th century) is called the 'lantern tower' and many books will tell you that it was used as a beacon to guide travellers crossing the valley of the Nene. Crossing the Nene at Irthlingborough will feature here another day, but for now just enjoy the tower and its position commanding the river. * Equally, Lord Bonkers has suggested to me that 'Irthlingborough' may be a corruption of 'Earthlingborough', showing that neighbouring settlements were once occupied by aliens. 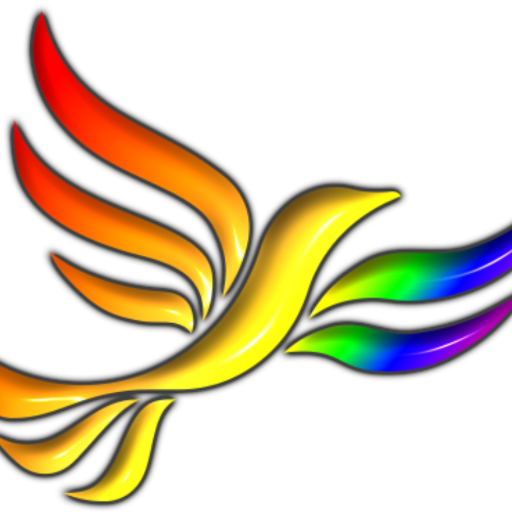 Matthew Green offers a sober assessment of Liberal Democrat prospects under our new leader. "The progressive alliance can only work when everyone is genuinely willing to work together. If they are all fighting over the same voters then it was always a fallacy." Neil Monnery draws a lesson from this year's general election campaign. "Looking back at the time of the 1967 Act even those supporting decriminalisation called homosexuality ‘a disability’ and ‘a great weight of shame’. Bisexuals didn’t even occur to them. Goodness knows what they’d think of all the diversity of sexuality we share today! It shows us how far we’ve come, how hard that fight has been, and how much further we still have to go." 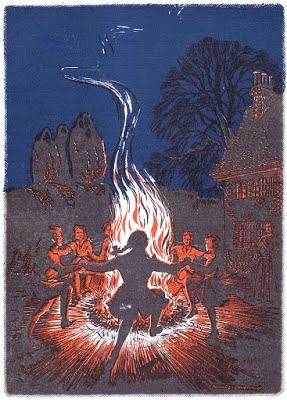 Jennie Rigg marks an important anniversary. Melanie Phillips is rightly critical of the way some exploited the plight of Charlie Gard and his parents. Social workers and other professionals need to do more to help looked-after children achieve their potential, and to diminish the ‘stigma’ of being in care, research has found. Alex Turner on the findings of a new survey. James Fitzgerald introduces us to the inhabitants of Eel Pie Island. We have our Headline of the Day. Well done to the Richmond & Twickenham Times. Rushden & Diamonds was formed in 1992 by a merger between two non-league team from Northamptonshire, Rushden Town and Irthlingborough Diamonds. The merger was promoted by Max Griggs, owner of the Doc Marten shoe brand, who funded the new club. The new club was remarkably successful. It rose through the non-league divisions and were promoted to Division 3 of the Football League (as its lowest division was then called) in 2001. Two years later they won it. After that they began to struggle, particularly after Griggs handed the club to its supporters. They were soon out of the Football League and were wound up in 2011. I was at the site of Rushden & Diamonds' ground, Nene Park, today. Once they brought Leeds United and Sheffield United here in the third round of the FA Cup and staged under 21 and non-league internationals. Even after Rushden & Diamonds folded, Kettering Town (a club with its own problems) played here for a while, and there was even talk of Coventry City being based here. "The building is in a dangerous condition and is unsafe. "The stadium represents a major fire risk. "The site is derelict and subject to wanton damage." It is not known what will become of the site - nothing has happened at Leicester City's old Filbert Street ground - but at least that was nice use of "wanton". And for the time being the blackberries growing there are very good. If you enjoyed film of Jonathan Meades at Marsh Court that I posted recently, here are two more contributions by the great mean that may be to your taste. And in June he spoke to John Mitchinson of Unbound Books at the London Review Bookshop about his career and in particular his new book. You can listen to the evening as a podcast and it is well worth doing so as Meades was in good form. St Mary the Virgin, Bottesford, is a beautiful church, known as "The Lady of the Vale" - the Vale of Belvoir, that is. But it is devoted more to the glory of the Dukes of Rutland than to the glory of God. So much so that the altar has been moved to near the chancel arch. After that it is tombs all the way. The result is a wonderful collection of 17th and 18th century sculpture after that the dukes were buried in a mausoleum at Belvoir Castle. One of the tombs has some dark history attached to it, which I shall write about another day. Back to the chancel arch. It is impossible to miss the arms of Queen Victoria (who, even in Bottesford,outranked the Duke of Rutland), but there is also has a faded medieval doom painting of the sort I photographed in Lutterworth. Richard Jefferies, the 19th century author I wrote my dissertation about, deserves to be better known. The work of Victorian nature writer Richard Jefferies is being brought to a new audience this summer. A series of cream tea and culture Sundays is being staged at his birthplace near Coate Water and it is proving popular. "The museum is dedicated to Richard Jefferies but a lot of people have never heard of him," said manager Mike Pringle. "Just wandering around looking at books in cases isn’t really doing justice to him. "We thought on Sunday afternoons when we’re open why not up the game a bit and make it an event rather than just a visit?" You can read more about the plans on the museum's website. A Labour councillor has quit after being deemed not a fit and proper person to drive a taxi by his own authority. Gurpal Atwal has resigned as the member for the Uplands Ward on Oadby and Wigston Borough Council. The resignation followed the failure of Atwal's court appeal against his council's own finding. You can read the allegations made against him, all of which Atwal denies, in an earlier Mercury report. "Oadby and Wigston Council officers and one or two local councillors have taken positions in this matter that impact on my ability to concentrate on working effectively as a councillor on behalf of the Uplands Ward constituents. "On that basis, I resign my seat as a Borough Councillor for Oadby Uplands Ward forthwith." A witness claimed in a statement that Atwal once boasted of having “Keith Vaz in my right pocket”. Elected in 2015, Gurpal Atwal was the first Labour councillor to win a seat on the Liberal Democrat run authority for some 30 years. Yesterday I was locked out of a church full of monuments to the local aristocracy - Exton in Rutland. Today I got into St Mary the Virgin's Church, Bottesford, where the Dukes of Rutland are buried. More of their tombs another day. For tonight, let's just enjoy the view of the church's 212ft spire as you approach it across a field path from the village's railway station. The Bonkers tombs in St Asquith's are very fine too, of course. "During last month’s election campaign, I made the most important political decision of my life. I resigned from the Conservative Party, for whom I had stood as a parliamentary candidate in 2015, to join the Liberal Democrats." Azi Ahmed explains why she is proud to be a Lib Dem newbie. Jay Rayner was asked to a meeting by Michael Gove so that he could share is expertise on the implications of Brexit for our food supply. He declined, but this is what he would have said. "The council’s advisors were clear that if planing guidance had been applied strictly then the council could have demanded over 1000 more affordable homes. They choose not to." George Turner dissects Wandsworth's mishandling of the Battersea power station project. Mark Collins on the extraordinary bonfire of paperwork that accompanied the end of the British Empire. 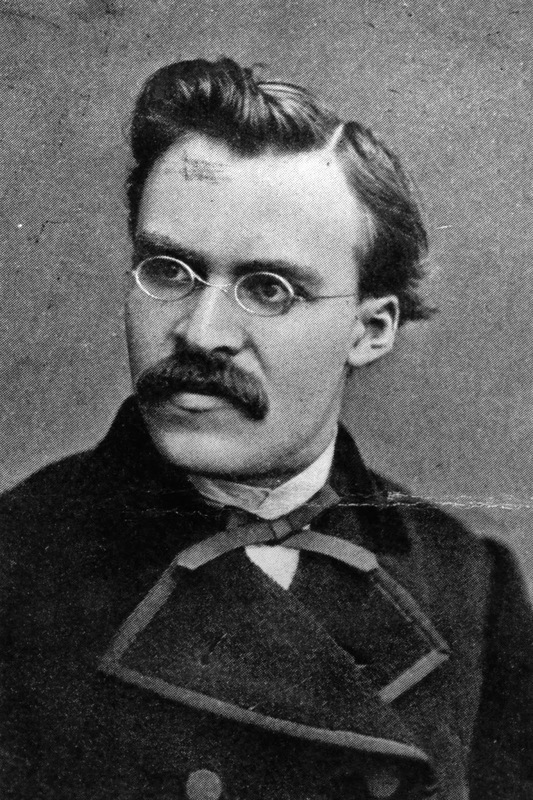 Alexander Star examines Friedrich Nietzsche's influence on America. "It occurs to me that watching the women’s game now is rather what it must have been like watching the men’s game in the earliest days of the modern era (in the 1870s and 1880s) : predominantly medium pace bowling and spin, well-pitched up, with the batsmen playing off the front foot with a straight bat." Backwatersman is variously ecstatic, bewildered or indifferent watching the Women's World Cup. The judges were unanimous in their praise for the reader who nominated today's winner, the Daily Telegraph. There are no churches in Rutland and few in England in which English sculpture from the C16 to the C18 can be studied so profitably and enjoyed so much as at Exton. The church contains nine important monuments, and several of them are of outstanding value. And the church's webpage says it is open during daylight hours. But when I got there today I found that, despite notices about CCTV and Church Watch, not to mention Divine Omniscience and the possibility of Eternal Damnation, it was locked. So I enjoyed a wander round the churchyard and the views of parkland. The church was largely rebuilt after being struck by lightning in the 19th century and given a slightly eccentric tower and spire combo in the process. Alistair Carmichael: "Liam Fox is acting like a tinpot dictator"
Andrea Leadsom demanded that BBC journalists should be "patriotic" - which in her mind consisted in telling everyone how well the negotiations with the European Union are going. Now Liam Fox has written to the BBC’s director general complaining that the corporation consistently runs negative stories about the economic effects of Brexit and demanding a meeting. At the back of all this nonsense lies the fact that the Conservative Party is no longer Conservative. Far from taking pride in British institutions - the National Health Service, our schools and universities, the BBC - they despise them. All must be punished by continuous reform, with the inspiration coming from abroad - usually the USA (though other models are available). There is something unpatriotic about the whole enterprise. But then it was also unpatriotic of Theresa May to allow Liam Fox back into the cabinet after he was forced to resign the first time around for putting people at physical risk by breaching the ministerial code. It follows that we should look back to those days if we want to understand the Labour leader's economic views. And that brings us to the Alternative Economic Strategy which Tony Benn put to the Labour cabinet (with some support from Peter Shore) in the autumn of 1976.
redistribution of income and wealth to eliminate some of the gross inequalities in Britain today. Note that withdrawal from Europe is central to this strategy, so we should not be surprised at Corbyn's comments on the single market yesterday. I am up for a fair bit of curbing capital's freedom of operation, but it is obvious that if that is to be done then it must be a multi-national enterprise. To pretend Britain can act and then prosper in isolation is a nonsense - and a nonsense that Corbyn shares with the Conservative right and Ukip. I was going to include Tom Kelsey's Guardian article drawing parallels between Concorde and Brexit in a Six of the Best, but it deserves an article in its own right. Only the captive national airlines of Britain and France ever operated Concorde. It was to be described by one economist as among the three worst decisions in civil investment in the history of humanity. Both Harold Wilson and Ted Heath wanted to cancel the project, but both had political reasons for not doing so, Then, when Margaret Thatcher was prime minister, Michael Heseltine attempted to be Concorde's salesman. The newspapers were saying what the powerful wanted them to say. Optimistic estimates about the future profits Concorde supplied by the British Aircraft Corporation filled the pages of the broadsheets and tabloids. The only journalist who called for Concorde to be cancelled with any persistence was the much-derided Andrew Wilson of the Observer. Other media voices were aware of the flaws in the project, but found their efforts to expose them hampered. In the late 1960s, the BBC reached a compromise with the BAC: the broadcaster could question the project as long as they gave Concorde’s manufacturers the right to reply. "You may not realise it but this was a very considerable movement forward", wrote a BBC news journalist. One difference between the two projects, I would add, is that Concorde was a thing of beauty whereas Brexit is very ugly indeed. If you live hereabouts you may have seen a street performer dressed as a silver statue swearing live on East Midlands Today. He told the Leicester Mercury why he did it. 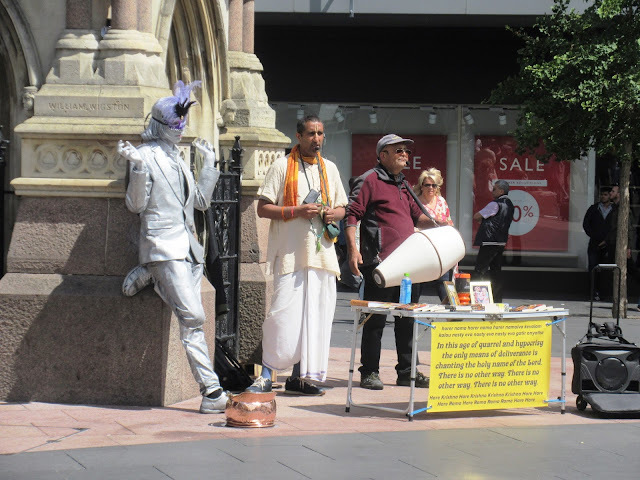 Anyway, I saw him by the clock tower yesterday, hanging out with the Hare Krishna people. I hope they will prove a calming influence on him. Mark Mills was never Kaiser Bill's batman, but he did learn a lot from being Vince Cable's intern. Jeremy Corbyn will never be prime minister. Or so Louis Mian reckons. Anoosh Chakelian reminds us that children's fiction can be political: "Although The Demon Headmaster: Total Control ... is not explicitly political, the effects of successive Tory government education reforms since the last book in 2002 weigh heavy on the plot and pupils." "The 'tough guy' narrative is seductive. It suggests we have control over our fate, that we can will cancer away. These are lies we tell ourselves. And for some patients that’s helpful. It gets them through the day. For them, it’s a useful tool. 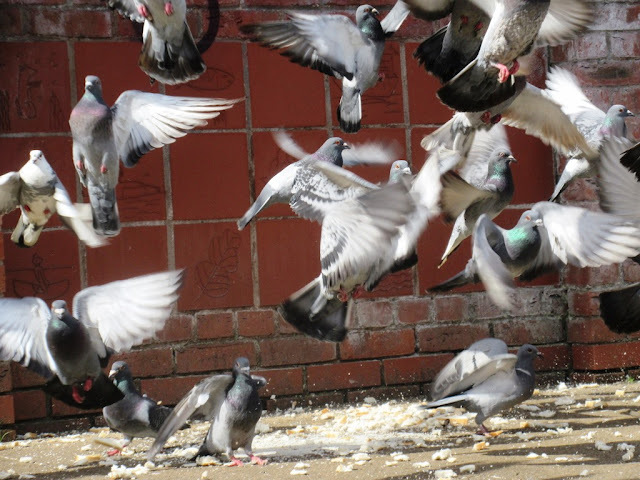 But courageousness is a standard that no sick person should feel like they have to meet." Josh Friedman, a cancer survivor himself, thinks some of the reaction to John McCain's diagnosis has been unhelpful. When Saturday Comes says Glasgow’s ghostly Cathkin Park, once the home of Third Lanark, stands as a warning to football’s wayward owners. "The internet tells me that Jane's Country Year was Malcolm Saville's favourite of his own books." Front Free Endpaper reproduces Bernard Bowerman's illustrations (one of which you can see here). Another song from the reruns of Top of the Pops. This was a hit in 1984, and sounds much better today than I had remembered. But I still don't believe the Thompson Twins know what it means to work hard on machines. 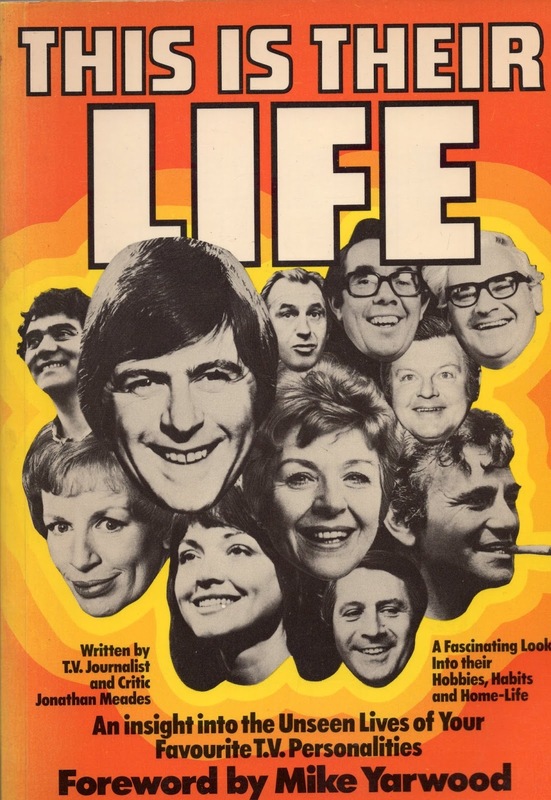 Published in 1979 complete with a foreword by Mike Yarwood, this is a collection of brief pen portraits of television stars of the day. Just to list those thought worthy of discussion brings back a lost era. James Galway, Wendy Craig, Ron Pickering, Dickie Henderson. Max Boyce, Pam Ayres, Brian Glover, Penelope Keith. And because this is 1979 no one on television is gay and only Trevor McDonald is black. But the real interest of This is Their Life lies in the identity of its author. 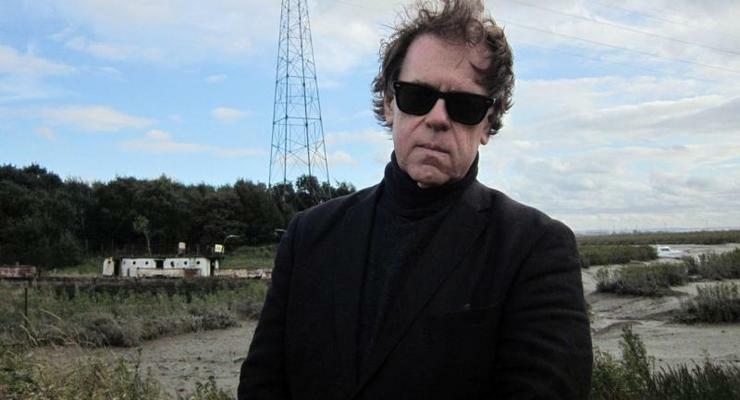 It is Jonathan Meades. Meades turned 32 in 1979 and fame was still some years away. So on first inspection this looks like hack work. But a bit of browsing reveals it is more interesting than that. There is the choice of subjects. I doubt any other young television journalist would have included Ian Nairn and W.G. Hoskins in his list. Look for it, and the acerbic comment is there too. David Hamilton, for instance, is “the lowbrow’s Michael Aspel”. Most of his material is written in conjunction with Wally Malston, who is apparently known as ‘King of the One-Liners’, and says that Rogers is ‘a barometer of what the public is thinking’. So be it, but he is hardly a barometer of what the public is doing. His passion is polo – he has four ponies and plays at Cowdray Park, which is also a regular haunt of Prince Charles. Described by his mother – herself an actress and the widow of the theatrical agent, Robin Fox – as ‘the world’s worst actor’, Edward Fox was for years overshadowed by his younger brother, James, who was arguably the world’s best actor, at least in certain roles. But the neatest digs are aimed at two targets who are still very much with us 38 years on – the Dimbleboys, as Meades says Bernard Levin used to call them. Their father, as everyone would have known in 1979, was Richard Dimbleby, who had been the most famous broadcaster of his day. Even before he became a professional journalist, he had to learn to live with accusations of privilege. At Oxford, where he took a third in PPE, his appointment as editor of Isis was opposed by the outgoing editor Kenith Trodd, who is now a noted drama producer, and his staff. Dimbleby countered with a swingeing attack on ‘the left-wing clique’. A couple of years later, some journalists took it upon themselves to advise him publicly not to attempt to follow in his father’s footsteps at the BBC. On the face of it it might appear that he has done just that, but, of course, his route and approach have been very different from Richard Dimbleby's. Whereas the father was ever reverential, the son - despite his looks and his smooth cap of hair - is rather an abrasive fellow. wanted to be a farmer, and his father succeeded in getting him a job on the Royal farm at Windsor, where he trained to be a showjumper. 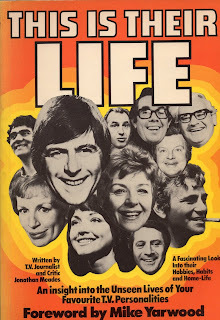 You can find This is Their Life on Amazon for a penny, which represents good value for students of popular entertainment and Meades enthusiasts. The Ludlow Advertiser wins our Headline of the Day Award. Many thanks to the reader who nominated this one. I was introduced today to the comic gold that is photographs of football mascots observing silences before games. 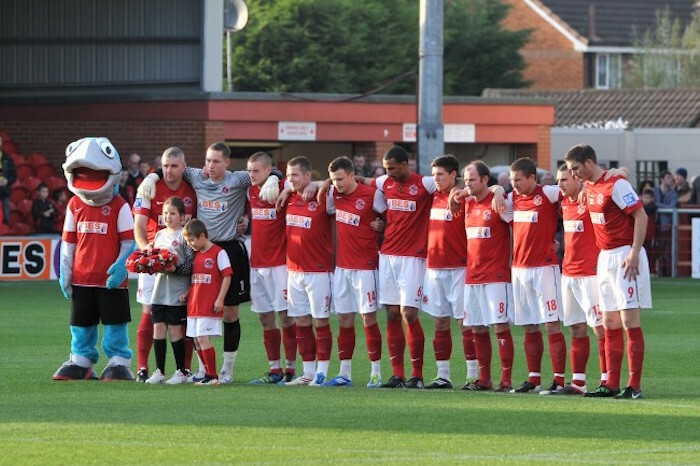 Here, borrowed from The Peterborough Defect, is a shot of Fleetwood Town's Captain Cod remembering the dead of two world wars.